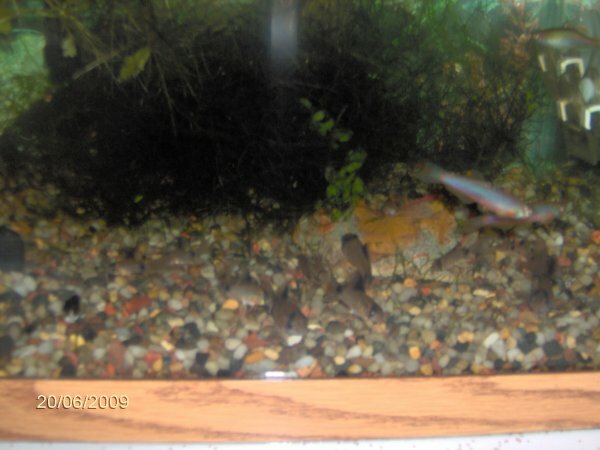 Three of my rosy danios on 11/29/08. For general danio sort of information, see my zebra danio page. The rosy danios are similar in many ways. Compatibility: Good but fast like most danios! Rosy danios should like the same sort of conditions as other danios with soft to moderate water of a pH slightly acidic. In most ways, their setup and water preferences are most likely the same as zebra danios. 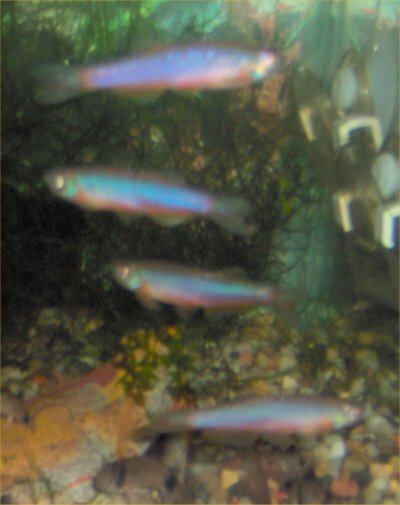 I bought my four fish on 7/6/08 and put them in my 20 gallon tank. They are all about an inch long. They are behaving like most of my other species of danios have. 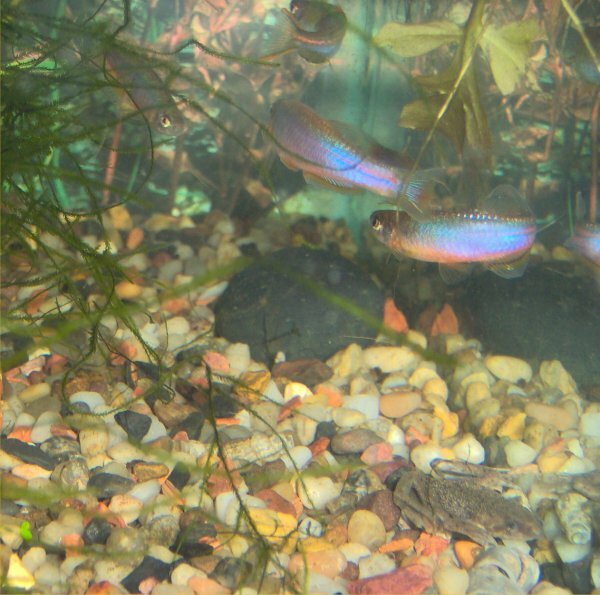 When I bought them, the store called them "purple passion danios" and Danio roseum . 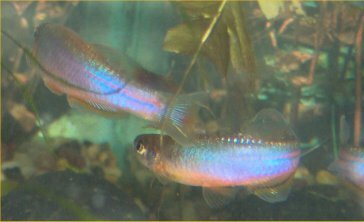 I found out that they are Danio roseus instead when I did an internet search. As of 9/24/11, there are only two rosy danios left. I never did confirm any fry from them. By 2012, only one rosy danio was left. He/she developed anorexia and a bent spine (perhaps fish tuberculosis) and wobbled around for a month or so. He/she was last seen in early March of 2012. All of my rosy danios are presumed dead. 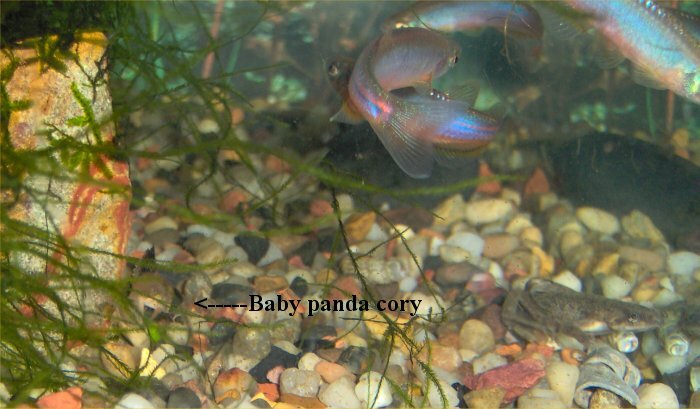 I was taking photos of a baby panda cory on 11/29/08 when I captured the rosy danios in the photos too. 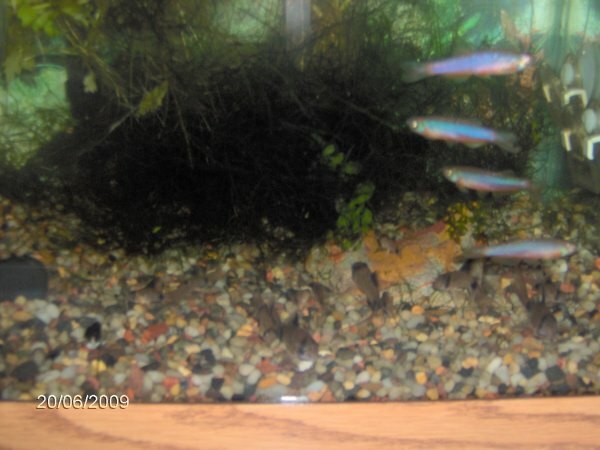 When I took photos of a lot of panda cories on 6/20/09, I also got these photos of the rosy danios. Four rosy danios - close-up of the last photo. 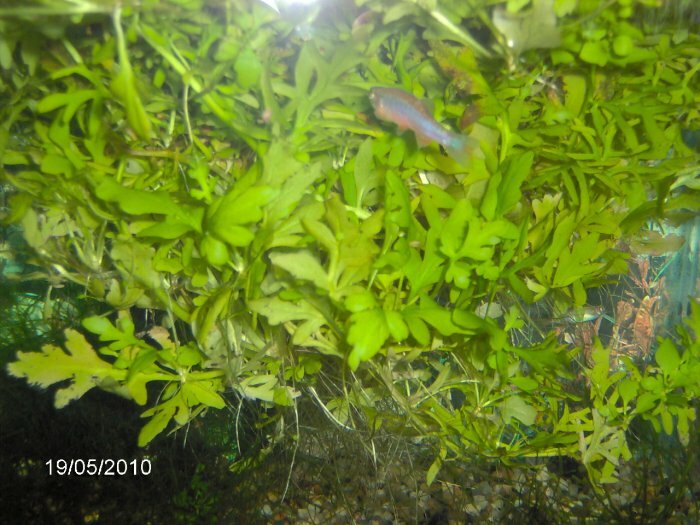 Rosy danio among the floating fern in the 20 gallon tank on 5/19/10.